In this week’s episode, Jason and I are live from Detroit Yoga Lab answering student questions about some of the most common yoga injuries, how to prevent and avoid them. Bonus banter: Find out why Jason has a black eye – unsurprisingly, it’s not from yoga or a bar fight. And learn what Jason’s three favorite bands are. 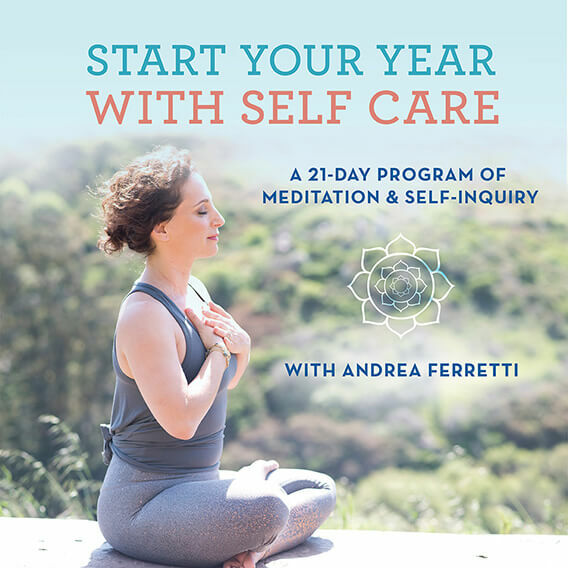 Scroll through the most recent yoga podcast episodes and makes sure you haven’t missed anything. 2. Care/Of is a new online vitamin company that is devoted to personalization and authenticity in its sourcing. Set your health goals, take their quiz, and they’ll give you vitamin, mineral, and adaptogen recommendations. They also include sourcing information and studies to give you background on your choices. I’ve had fun trying them out! 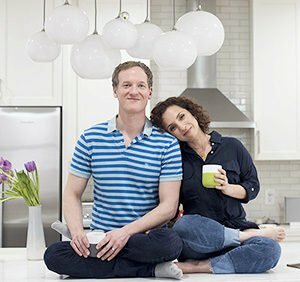 Visit takecareof.com and use offer code YOGALAND at checkout for 25% off your first month of vitamins. OK, now onto the regularly scheduled program. 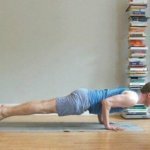 Since writing the Expert’s Guide to Chaturanga Parts I, II & III, I’ve gotten tons of questions from readers about transitioning to Chaturanga. This makes sense. After all, Chaturanga is always sandwiched between Plank and Up Dog. So, it stands to reason that Plank is going to affect Chaturanga and Chaturanga is going to affect Up Dog. Students and teachers also need advice about coming into Chaturanga—or lowering all the way to the floor—when they’re dealing with a shoulder issue. The two most common transitions to Chaturanga are lowering down from Plank and jumping back from Uttanasana (Standing Forward Bend). So, let’s look at the best practices for these scenarios. 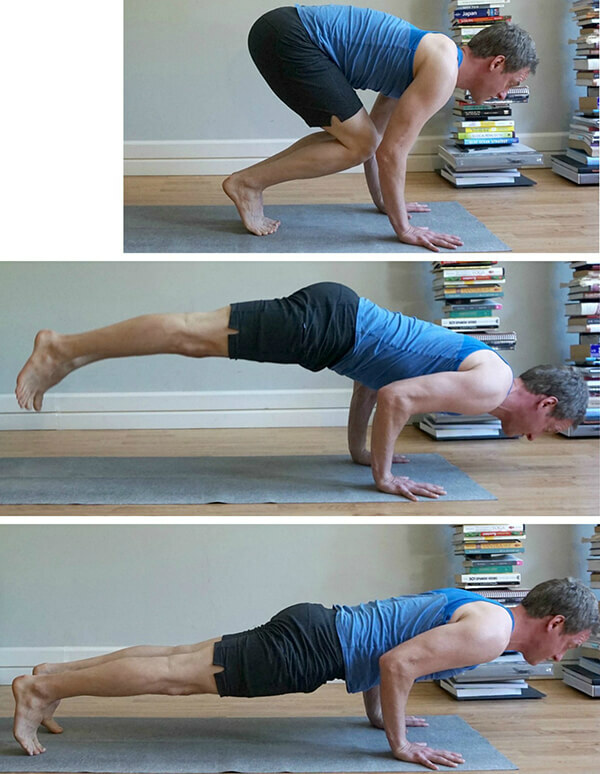 Lowering to Chaturanga from Plank is a foundational transition in vinyasa yoga. Moving slowly and precisely will strengthen your entire body, especially your core and upper-body. Transitioning with control also lengthens your breath and builds postural awareness. When students transition too quickly, they miss the opportunity to build strengthen and control. 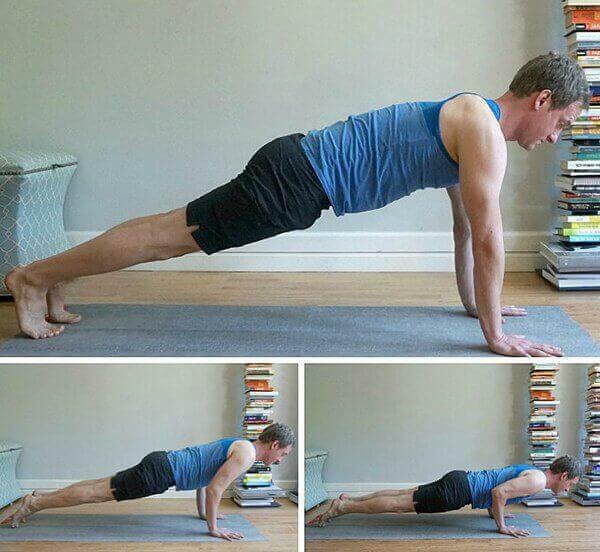 Even more, transitioning too quickly often results in a sloppy Chaturanga. 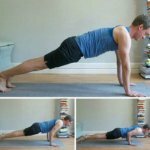 So, if you’re moving quickly from Plank to Chaturanga, practice slowing the transition down in order to reap the benefits. If you’re not strong enough to slow down, bring one (or both of your knees to the floor). The most important tip for making this transition skillfully is to move your body forward as you’re lowering down. Think about an airplane landing compared to an elevator lowering. The airplane is moving forward as it descends, while the elevator is moving straight down. You’re the airplane, not the elevator. The key to doing this tip correctly is your feet. When you’re in Plank, you’re on the ball of your feet. When you transition to Chaturanga, you should rock forward to the tips of your toes. Come into Plank Pose and notice that you’re on the ball of your feet. Simultaneously rock forward to the tips of your toes and bend your elbows. Feel your chest and shoulders moving forward while you’re bending your elbows and lowering half way to the floor. Engage your thighs, engage your core, and land in Chaturanga. Notice that you’re on the tip of your toes, not the balls of your feet. 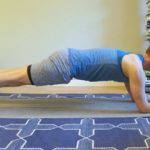 Although it’s beyond the scope of this article, you might also notice that being on the tip of your toes in Chaturanga makes the transition to up dog much more fluid and accessible. Jumping from Uttanasana to Chaturanga is strong, dynamic transition. In all of the modern schools of vinyasa yoga, this is another staple transition. The reason that this transition requires more strength than lowering from Plank to Chaturanga is simple: when you jump back from Uttanasana you have to deal with the momentum of jumping. More specifically, you have to slow down the momentum of springing into Chaturanga without dropping your upper-body too low and compromising your shoulders. But, when you can make this transition skillfully, few things in vinyasa yoga feel as smooth, integrated, and fluid. There are two keys to jumping back with better control and, they’re related. First, you need to bend your knees more deeply and get closer to floor before you jump back. Second, you need to focus on pulling your chest forward as you jump your legs back. The first step brings your body weight closer to the floor so that you can control it better. The second helps you counterbalance the weight and momentum of your lower body moving back by bringing the weight and momentum of your upper-body moving forward. While you’re in Uttanasana prior to jumping back, bend your knees deeply. Place your hands on the floor in front of your shoulders. Get nice and low — almost like you’re going to do Bakasana. Look forward. Bend your elbows and lean your weight forward into your hands. Simultaneously, jump your feet back and pull your chest forward. You want these two motions to help counterbalance each other. Land lightly Chaturanga. Take this slowly and repeat it several times to help you integrate this new, more effective pattern. If you’re nursing a shoulder issue and lowering into Chaturanga irritates it, the first step is to bring your knees to the floor. The second step is to focus on the front of your shoulders and your shoulder blades when you descend. You need to control both regions in order to keep your shoulders aligned and stable. Specifically, you want to pull the front of your shoulders (the head of your humerus bones) away from the floor and engage your scapular muscles and draw your shoulder blades toward each other. If you try this approach and it still irritates your shoulder, my advice is to take a breath, back off, and avoid this transition for a while. People will still love you. It’s OK.
From Plank Pose, bring your knees to the floor. Slowly roll down while keeping the front of your shoulders elevated. Meaning, don’t lead with your shoulders by dipping them forward and down toward the floor. Instead, keep drawing the front of your shoulders away from the floor and slowly lower your thighs, hips, navel, and front ribs to the ground. Again, keep the front of your shoulders lifted and your scapular muscles engaged while you do this. Sign up for our newsletter and you’ll be the first to know when these posts go live! We’ll also send you Jason’s Guide to Mastering Arm Balances and 5 free peak pose sequences. Because we love you. You might also need a temporary reprieve from Chaturanga if you’re nursing a shoulder, elbow, or wrist injury. And, if you’re a vinyasa yoga teacher, you definitely want to have a few modifications and alternatives to Chaturanga up your sleeve. 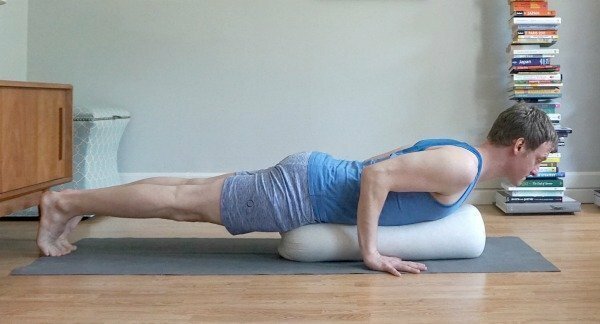 Although this is a little cumbersome because it requires a bolster—which may prove unwieldy in a flow class—the is modification supports your body weight and allows you to get a whole body feel for Chaturanga without physical rigors of the pose. This will help you build muscle memory. How to: Simple. Just lay on a bolster like the picture demonstrates. It doesn’t get more straightforward than this. This is nearly identical to the previous version. It’s less lux, but it’s easier to accommodate since people more often have blocks at home than bolsters. Plus, it’s possible to integrate a block in a flow class more easily than a bolster. The block supports enough of your weight to be helpful, but still requires you to work your legs and core. How to: Again, pretty simple. Come onto all fours and place a block under your chest. You’ll have to experiment with using the side and end of the block to determine what works best with your proportions. Bend your elbows 90 degrees, rest your sternum on the block, and straighten your legs. This has a steeper learning curve than the previous versions, but it’s my favorite overall Chaturanga modification. Wrapping a strap around your elbows will stop your torso from lowering too close to the floor and prevent your shoulders from moving into extension. The strap also supports some of your weight while still requiring you to work your shoulders, core, and legs. How to: Make a loop with your strap. Wrap it around your arms just above your elbows. You want the loop to be large enough that when you bend your elbows for Chaturanga, your upper arms will touch the sides of your ribs. Once you figure out the correct diameter for the strap, give Chaturanga a shot. You’ll like it. Bringing your knees to floor supports your weight and helps you work more skillfully with your upper-body. You can choose to bring one or two knees down depending on how much support you need. This is the perfect option to take in a flow class if you just need a little support. And, hey, we all need help with things from time-to-time, so don’t hesitate to take this option if it helps you keep integrity in your shoulders. How to: Just bring a knee or two to the floor. Tada! It’s that simple. If you have a shoulder and wrist challenge, getting to the floor isn’t possible. If it’s not possible to get to the floor or do Plank without pain, it’s to give yourself a break. 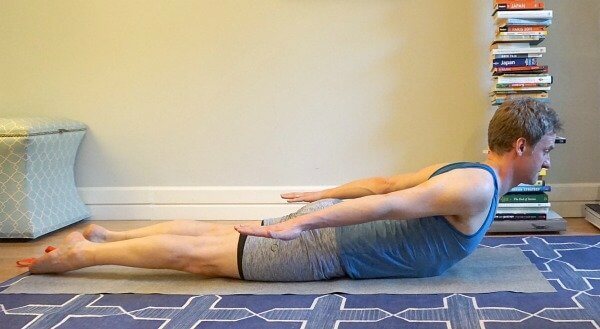 But, if you’re comfortable with Plank and the transition to the floor, practicing Locust with your palms facing the ground is an excellent option. In very broad strokes, turning the palms toward the floor externally rotates the arms and strengthens part of the shoulder joint that is highly beneficial to many different shoulder maladies. How to: From Plank Pose, bring your knees to the floor and slowly lower to the floor. Hug your elbows toward the sides of your body as you lower down. Once you’re on the floor, reach your arms alongside your torso and place your palms on the floor next to your hips. Lift into Locust Pose. Raise your arms and your hands. Keep your palms facing the floor even as your raise your arms and hands. Take a breath or two. Lord have mercy, I know that I’m going to catch flack for this, but I don’t think “Knees, Chest, and Chin,” is a good Chaturanga alternative. Here’s the deal: I don’t have any problem with “Knees, Chest, Chin,” except for when it’s used as a preparation or alternative for Chaturanga. Here’s why: The most common and dangerous mistake made in Chaturanga is lowering the shoulders too far and lifting the bottom too high. This is exactly what happens in “Knees, Chest, Chin.” When the knees are on the floor, this isn’t a problem. Which, again, is why I don’t have any problem with “Knees, Chest, Chin.” But, when “Knees, Chest, Chin” is associated too closely with Chaturanga, it teaches the exact opposite neuro-muscular pattern that one should develop for a healthy Chaturanga. Think about it — and, don’t hate me. How to: Don’t. ☺ At least not as an alternative or modification for Chaturanga. I’ve had exceptional yoga teachers over the years, but I also love to work with medical professionals and physical therapists to get their thoughts about body mechanics, alignment instructions, injury management, and injury prevention. Paul Roache, MD is a board certified orthopedic surgeon (with a sub-specialty in shoulder surgery) who I’ve worked with for more than 10 years. Paul has been my student and assisted my classes over the years, and we’ve taught trainings and workshops together, worked with private clients to manage their shoulder injuries, and created an online anatomy program called, Essential Yoga Anatomy with Yogaglo. Paul has not only refined my thoughts about shoulder mechanics and shoulder alignment, he’s done something much more important: he’s broken down why particular shoulder alignment patterns are so important and helped me understand which parts of the shoulder are most likely to be overly stressed when they’re misaligned in postures, especially Chaturanga Dandasana. 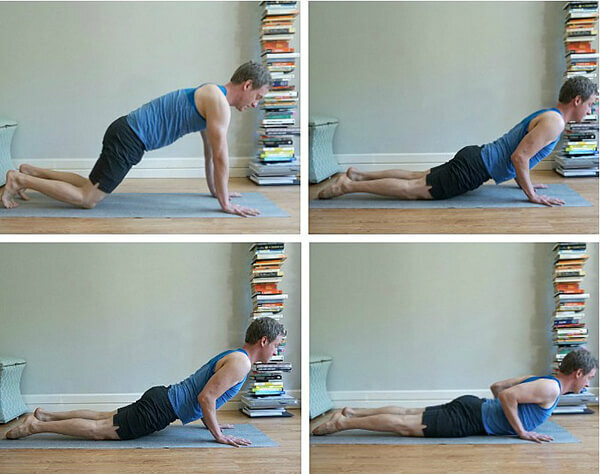 Although Chaturanga is demanding, keeping your shoulders safe is relatively simple. In fact, for students with otherwise healthy shoulders, there are two ways to protect your shoulders from injury in this pose. First, make sure that your shoulders don’t move into extension. Instead, keep your elbows in line with the side of your torso. If you lower your torso — or dip your shoulders — too low, your elbows will move behind your body and put your shoulders at greater risk. Second, firmly squeeze your elbows against the sides of your body, rather than allowing them to separate away from your torso. The photos below show you what these dynamics look like. If you want a quick, easy solution to keeping your shoulders happier and healthier in Chaturanga, there you have it: Maintaining shoulder stability in yoga postures is the most effective way to protect your shoulders from injury. Hug your elbows into your side-body and don’t go so low that your shoulders move into extension. Those are the doctor’s orders. If you want to nerd-out a little and dig deeper into the rationale for these actions, stay tuned — it gets very interesting (if you find this kind of thing interesting). 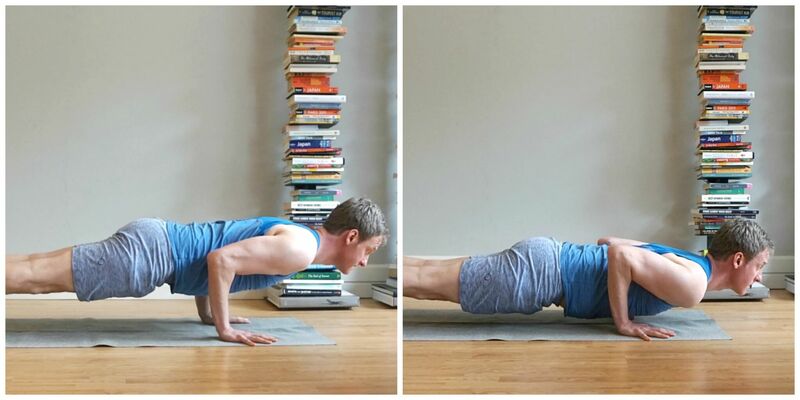 If you don’t do the two actions above in Chaturanga, your shoulders will be less stable and more vulnerable. 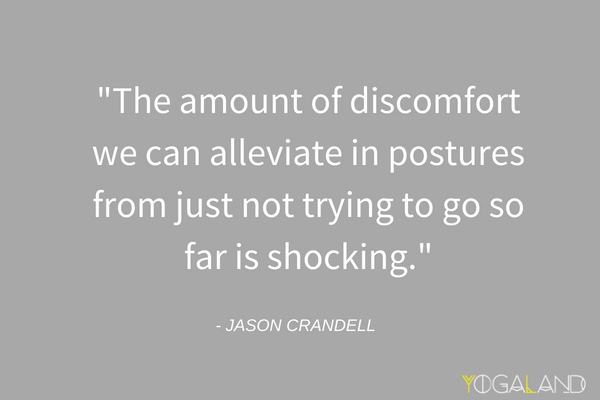 To understand why this is the case, we need to compare the two major ball and socket joints of your body—your shoulders and your hips. Your hip socket is a deep cup made almost entirely of bone. The ball (head of the femur) sits almost completely in this cup of bone. Since the ball sits deeply inside the cup of bone, it’s inherently stable. This means that the femur is not dependent on the surrounding muscles to stay in the socket. Whereas your hip joint is inherently stable, your shoulder’s ball and socket joint is inherently unstable. Your shoulder’s ball and socket joint (the gleno-humeral joint, or GH) has a deep socket on the shoulder blade, but the boney cup of the socket is very shallow. In fact, the majority of the socket is made of ligaments and muscles. 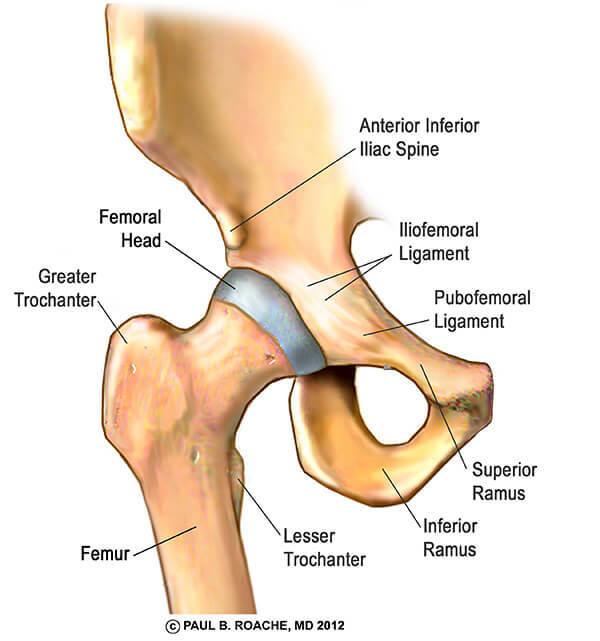 In your hips, the cup that your femur sits in is comprised of bone. Your shoulders are different. The bottom of the cup that the humerus sits in is bone, but the remainder of the cup is comprised of muscles and ligaments. The ball requires the muscles, ligaments (and several other factors) to work together to keep the ball in the socket. This means that the ball can move outside of the socket if the surrounding muscles, ligaments (and other factors) don’t do their job properly. You can see these distinctions clearly in the images below. You’ll see that the head of the femur is entirely encircled by bone. 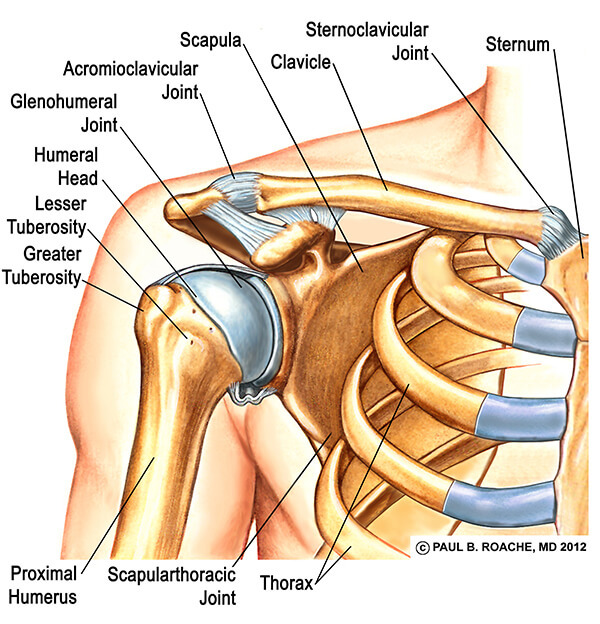 Comparatively, you’ll see that the humerus has much more shallow contact with the scapula. SO WHAT DOES THIS MEAN FOR CHATURANGA DANDASANA SHOULDER ALIGNMENT? Remember, maintaining shoulder stability is the most important key to keeping your shoulders safe in Chaturanga. 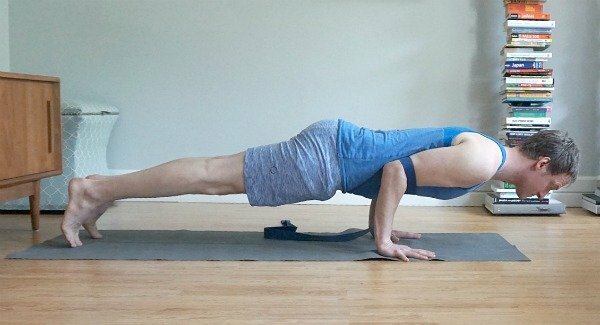 So, what are the most common situations in Chaturanga that decrease shoulder stability and leave the shoulder vulnerable to injury? 1) When the elbows move away from the body. 2) When the torso lowers below your elbows and your shoulders move into extension. 3) A combination of moving the elbows away from the body and lowering the torso below the elbows. So, when you do any of the three actions above, it decreases shoulder stability, which can lead to a host of problems including impingement, rotator cuff strain, inflammation and more. On the other hand, when you keep your torso level with your elbows and hug your elbows against your torso, you maximize the stability of your shoulder joint. These are simple enough concepts, but they are challenging to perform. 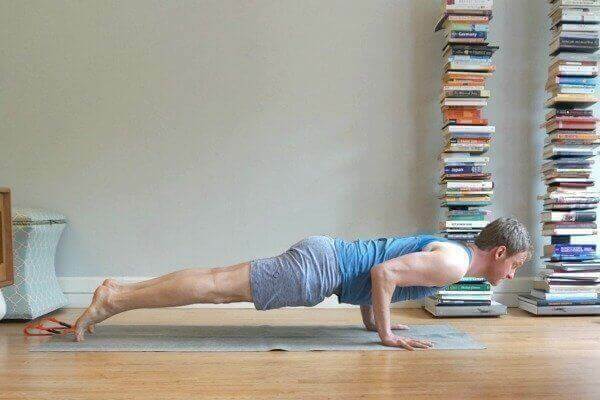 Of course, developing the strength to maintain these shoulder positions in Chaturanga is incredibly difficult. And, students often need good alternatives to Chaturanga —especially if they’re not strong enough to do the pose or if they’re managing a shoulder or wrist issue. I’ll tackle these topics in Part II & III of this series (sign up for our newsletter so that you don’t miss out when they go up). In the meantime, keep your shoulders healthy!